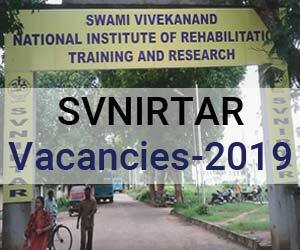 New Delhi: The Swami Vivekanand National Institute of Rehabilitation Training and Research (SVNIRTAR), Odisha has released 16 vacancies for Consultant, Junior Resident and Senior Resident on Contractual Basis. Swami Vivekanand National lnstitute of Rehabilitation Training and Research (SVNIRTAR) is an Autonomous lnstitution under Department of Empowerment for Persons with Disabilities, Ministry of Social Justice and Empowerment, Government of lndia. lt is one of the premier lnstitute of its kind in the Country and the main objectives of the lnstitute are Human Resource Development to undertake, sponsor or coordinate training of personnel such as Doctors, Engineers, Physiotherapists, Occupational Therapists, Multipurpose Rehabilitation Therapists and such other personnel for the Rehabilitation of Persons with Disabilities. lnstitute conducts Short Term/Long Term Courses in the field which are affiliated to Utkal University, Bhubaneswar. The lnstitute has been set up to serve the differently able persons to undertake any action in the area of rehabilitation of the Persons with Disabilities and is facilitated with 100 bedded hospital to treat the needy, poor and differently abled (Divyangjan) section of the society. Last date to apply: 01-04-2019. The Vacancies are in the Department of PMR, Physical Medicine & Rehabilitation, MBBS, Nurse, Prosthetist and Orthotist. Duration: 1 year (yearly basis up to 3 years). Consolidated Pay: Pay Matrix Level-11 Basic Pay Rs.67,700 + NPA and other allowance as admissible under Central Residency Scheme. Qualification: MBBS from lnstitution recognized by MCl. The candidate must have completed compulsory internship and must produce internship completion certificate and registration under any state. Physical Medicine & RehabiIitation: 1. MD in Physical Medicine & Rehabilitation or 02 years Diploma course in PMR after MD Medicine from a University recognized by MCI or Diplomat in PMR from National Board of Examination or any other equivalent qualification. 2. 3 years teaching experience as Sr. Resident or General Duty Medical Officer or Lecturer in a recognized lnstitute in related field. Duration: 6 months (6 monthly basis up to 3 years). Nurse: B.Sc. Nursing or Diploma in General Nursing and Midwifery and registered with one of the state Nurse, registration councils in lndia. Prosthetist and Orthotist: Degree from a recognized lnstitute in Prosthesis and Orthosis. Minimum four years experience of having worked in the related field. Physical Medicine & RehabiIitation: 45 years. Nurse: Age- Below 30 years. Prosthetist and Orthotist: Age- Maximum 40 years. Physical Medicine & RehabiIitation: Rs. 1,20,000/- per month. Prosthetist and Orthotist: Rs.35,000/- per month. 1. Candidates who are in Government Service should apply through proper channel only. 2. Age relaxation will be given to reserved category candidates as per Govt. of lndia rules based on submission of authenticate certificate. 3. Selected candidates will be posted at SVNIRTAR, Olatpur and its Sub-Centers. However, they are liable to be transferred to offices anywhere in lndia under the control of SVNIRTAR. Applications in the prescribed proforma along with self attested passport size photograph, copies of certificates and mark sheets in support of their age, educational qualification, caste, experience, etc. will be sent by post only. Last date for receipt of application is 1st April, 2019. The applications received in other format will be summarily rejected. Only shortlisted candidates will be called for interview/written test. The appointment will not confer any right/claim/entitlement for appointment on regular basis in future. The envelope containing the application should be super-scribed with “Application for the post of…… …’ SVNIRTAR, Olatpur, Bairoi. Completed applications in the prescribed format along with relevant enclosures should reach “The Director, Swami Vivekanand National lnstitute of Rehabilitation Training and Research, Olatpur, post: Bairoi, Dist. : Cuttack, Odisha, Pin: 754010 on or before 1st April, 2019.